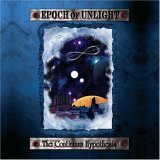 Intense melodic metal in the vein of the Gothenburg style would best describe what metal veterans Epoch of Unlight have accomplished here on the outfit's latest 11-track offering. Sounding at times like the second coming of At the Gates on cuts like "Denubrum", while tracks like "Argentum Era Secui Duos" could easily pass for a early recording of In Flames, this Tennessee-based quartet have been at it for 14 years, and show no remorse on tracks like the seething "Highgate". Incorporating the American thrash metal sound with a Euro death metal growl in tow, The Continuum Hypothesis has implemented the classic Swedish metal sound and feel without sacrificing the band's '80s thrash metal appeal. If you yearn to bang your head, Epoch of Unlight offers the proper soundtrack to act upon.